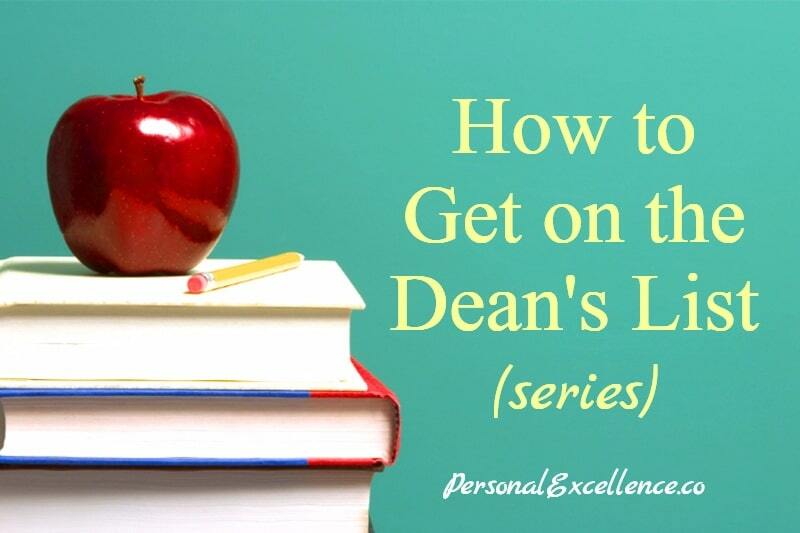 Rather than think about “how to get on the Dean’s List,” think in terms of getting the top results. That’s because the Dean’s List is but an effect of achieving the top results, and the cut-off for this list fluctuates every semester based on the performance of the overall cohort. This means the cut-off is only determined after the exams, when results are tabulated. In an average semester, 4.5 or 4.6 out of a 5.0 score (4.5 is A-, while 5.0 is A or A+) gets you onto the list. However, in a semester when all the students do extremely well, the cut-off may be as high as 4.7 or above. So if you start the semester aiming for 4.5 score (average A-), you might not get into the list if everyone does very well. It’s much easier to aim for the top and end up within the top 1-5%, rather than to aim to be the top 5% which is a very subjective goal. How do you calculate 5% of the cohort anyway? How would you know who’s getting what grades? How are you supposed to set your target if the context is hazy to begin with? And does it even matter? The most important thing is to aim for your best target. If aiming to be the top is a little hard to stomach for you, then just focus on being the top student for each module you take. That isn’t so hard, is it? From my experience, if you get your coursework in place, understand the materials thoroughly, and do your best, being the top performer is an inevitable outcome. What I love about being in university is you are now in charge of what you want to study, right down to the modules for each semester. This also means that you are responsible for your timetable and for planning your workload across your 3-4 years of study. Some students like to have a heavier workload in the first 2 years of their study, leaving more room for other activities in their last year. Some students even out their course work throughout their semesters. I belong to the latter group. Ultimately it’s up to you and what you prefer. There’s no right or wrong way. You just have to make sure you are able to commit to the workload you have planned. Who’s teaching what. Some modules are taught by different lecturers each semester, who have different styles of teaching. Subsequently, the materials and exam standards are different. Some lecturers have open book exams, some have closed book exams, while some don’t have any exams. These information are usually available on the university site. You can also consult seniors or peers who have taken the modules. Course workload. Each module has its own workload. Some require heavy commitment (I took a Japanese module which probably had a heavier workload than any of my Business modules), while some can be breezed through. You can get some indication from the course description. Who’s taking the module. Some modules are prerequisites for a higher level module. This means that in a particular semester, there will be a lot more seniors taking it to clear their prerequisites. Lesson timing. You need this to plan out your time table. Exam dates. Different subjects have different exam dates. The dates can be any date during a 2-3 week exam period. If the module has multiple lecturers, take the modules in the semester with the better lecturer and when the style of teaching is more suited to you. Personally I hate rote learning (learning through memorization and without understanding of the topic), so I would pick modules during semesters with open book exams, where students are tested more for their understanding of the subject. If there’s no exams, that’s even better :D. I find that it’s easier to manage your grades through projects/assignments, which are products of consistent work than exams, which is essentially your performance during 2-3 hours. I’m also a big fan of webcast lectures, since I can skip lectures and study when I feel like it. Get an even playing field. If you are a junior and many seniors are taking this class that semester (to satisfy a prerequisite for their higher level module), take other modules if you can. Firstly, your seniors will have an advantage over you in terms of their baseline knowledge. Secondly, students tend to work harder in their second and third years of study, because the reality of graduation is sinking in and the importance of getting a high GPA (for their resume, employment) hits them. Some of my third year modules were intensive, and if a junior tried to take that module during their second year, they would have been squashed by the seniors. Taking modules with peers evens out the playing field. Plan your timetable well. Strategically planning out your time table gives you time for other activities, whether for non-school activities, for studying, or for leisure. I always arranged my classes such than I only needed to be in school for 3 days. If I had webcast modules where I would skip the lectures, sometimes I would just have 2-day school weeks. That saved me a lot of commuting time since it took me almost an hour to get to school, and another hour to get back. I could use this time for other stuff, such as project work, sleep, or leisure. Space exam dates apart (where possible). I always made sure to space my exam dates apart. Sometimes, just having an extra day for revision can be crucial. The further you can space them apart, the better (you can use the time in between to relax). I would have 3-4 exams spread out in a 1.5 week period (some of my modules had no exams). Have modules that balance out. Unless your schedule permits, don’t pick all 5 modules with heavy workloads. If a module you are taking is extremely intensive, pick lighter modules to go with it. Pick modules with content synergy. This is more of a bonus tip. If you see modules with similar themes, take them so that you can cross apply what you learn. Since I was a marketing major, I took this technopreneur module from a different faculty, which was about marketing, technology, and entrepreneurship. It was a great opportunity to apply what I learned in my major. Subsequently I scored well in the module. Project work – Group projects. A staple in university, especially in Business school. Attendance – Rare. I only had this for a Japanese module. It seems that the Japanese are particular about punctuality, attendance, and timely submission of work. The components are given a weightage. A sample allocation can be 40% for exams, 30% for project work, 20% for assignments, and 10% for participation. All this information should be available on your university site or given out by your course coordinator. If not, someone is slacking on their job. Please ask for it from your university office. Knowing what you are evaluated on tells you what you should focus your effort on. Some of my coursemates spent a lot of time studying, when exams only contributed to 30% of the grade (the rest being project work, tutorials, and participation). On the other hand, they never spent as much time on the other components. They don’t participate in class, don’t do much for their projects, and finish their assignments at the last minute. Perhaps it’s because the evaluation method in secondary school and junior colleges was always 100% exams. If your module assigns 10% for assignment, 30% for group project work, and 70% for exams, then allocate your effort in that manner. Don’t spend 80% of your time doing your assignment, 20% on your group project, and 0% studying for your exams. You don’t get extra marks for spending more time on a small component. The 80/20 rule applies in studies too. Remember back in elementary school where it’s normal to get full marks for your tests? Well it’s no different in university. If you want to, it’s possible to score full marks, whether for your project work or your exams. Why not? After all, if your work warrants it, there’s no reason why the professors wouldn’t give you the best mark. I didn’t start university aiming to be the top student in my modules, but halfway through the semester I realized that I was the top student in some of my modules, and it wasn’t as hard as one would think. I was just doing my own thing and getting my act together. No hard-core mugging, no magic tricks, or anything like that. In fact I was busy with my core-curricular activities, running my web design business, and giving private tuition, and had time to play games and go out with friends. I suspect a lot of beliefs about how difficult it is to score well in university are self-created. I knew the other students who did well too, and they are real people like you and me. Just focus on putting your best foot forward, and everything else will fall into place. So don’t hold back. With every component you are evaluated on, aim to get the best marks. It is possible, but first you have to set that as a goal first. If you subconsciously place a mental limitation on what you can achieve, you’ll only reach that height because you are holding yourself back. But if you recognize that you can indeed get full marks, you will set yourself to achieve that. If you are taught a new concept on the day, then understand it before the class ends. Finish reading the materials before packing up. If you don’t know what the teacher is talking about, then ask your friends. Better yet, consult your teacher. There is no better way to learn than from the source. Make sure you know what he/she is talking about before you leave. Don’t leave it hanging on your mind. This is important because otherwise, you create extra work for yourself. Some of us may say we will study later when we get home, but how many of us actually do that? I know I wouldn’t. I would just hit the sack or play games. At home, there are a lot more distractions, compared to in the school where the environment is conducive for studying. You have to overcome a lot more just to study at home. What’s more, even if you do overcome the distractions and study, what’s to say you will understand the materials fully? The professor isn’t there, your friends aren’t around, and it’s a drag to wait for another time to consult them. All this work can be prevented if you learn the content right when it’s taught, with the resources at your disposal. The burden of not understanding the content will weigh on your mind. It may not seem significant, but imagine this weight compounding over the semester. As the burden becomes bigger, you build up a large resistance toward studying this module. Whereas the initial thought on your mind is “I don’t understand this concept in the module”, it will eventually turn to “I don’t know this module well,” to “I’m not good in this module,” to “There’s no point in studying since I’m not good in this.” While you keep saying that you will catch up on the work when you go home, you never do because the weight of the work overwhelms you. All this while, it’s just the mental fear that’s built up in your head. And you waste so much energy trying to overcome this mental fear, just to study — when you could have simply studied and understood the concept right when it was taught in class, when the environment was the most conducive for learning. There’s a thin line that separates the strong performers and those who lag behind, and this is the difference. Learning the things as they are taught, rather than deferring to an infinite future. During lectures and tutorials, whenever there was something I didn’t understand, I would clarify them on the spot. I would get all the issues ironed immediately so that I didn’t have to deal with them later. Consequently, I rarely needed to study in my free time. I find that many seemingly complicated questions could always be easily addressed on the spot. In fact, the complications are more in the mind than anything else. Some of my coursemates often lamented about the chapters they needed to catch up on. They would say the same thing week after week, saying that they would read up on it, but never doing so since the thought of catching up on the materials overwhelmed them. They would procrastinate on studying, and then they would anguish over their procrastination. All this, when it could have been avoided at the onset. Don’t create unnecessary problems for yourself. Get your stuff right the first time, and you spare yourself a whole lot of pain later on. Lectures are meant for theoretical understanding, while tutorials are meant for in-depth discussion and application. If you go to your tutorials unprepared, you are going to lag behind. Not only that, but you can’t fully benefit from the class discussion. Make sure you study and do your tutorials before going to the tutorial sessions. It will go a very long way. How much you prepare for your tutorials and how much of the content you understand during tutorial classes are an good indication of how you will perform for the exams. The exam questions are usually similar to what’s discussed during the tutorial classes too. If you prepare well for your tutorials, that’s already more than half the battle won. The remainder is doing well for your project work and occasionally revising to keep the content fresh in your mind.